Last weekend was the second act in this year's two-part Global Marijuana Marches, aimed at celebrating global cannabis culture and pushing marijuana law reform. Last week, we focused primarily on North America; this week, we look a little further abroad. According to organizers, marches took place in some 263 cities worldwide -- from Amsterdam, Abbotsford (BC), and Auckland to Wichita, Wellington, and Zagreb. Marches took place on every inhabited continent, with turnouts ranging from a few dozen to more than a hundred thousand. Few problems were reported. The single largest event took place in Rome, where organizers estimated the crowd gathered at the Plaza San Giovanni at somewhere between 200,000 and 300,000. In Rome, marchers demanded repeal of Italy's L.49 drug law, which they complained is "the toughest in the West." "What we want is the cancellation of L.49, the end of arrests and increasing persecution against users and self-growers, the right to relief for patients, the end of 1930-style terrorist campaign on media against all scientific evidence, and the official revaluation of the multiple properties of this ancient plant," said Rome event organizer Alberto Sciolari. Police and the media downplayed the numbers, Sciolari said, but the event was huge. "The plaza was completely full, and there were still thousands of people trying to get in," he reported. "The trade unions held their May Day concert there last weekend, and the TV talked about 'almost one million people' being there then, and our crowd was only slightly smaller." Rome has emerged as the monster of the Global Marijuana Marches, drawing about 35,000 in 2007 and doubling that to 70,000 last year, before exploding this year. That's no surprise, said Sciolari. "Every year there is a sharp increase in participants, probably because it is a regular event, and people learned to wait for it much in advance, and tell friends, without much need of promotion. The date is fixed year after year, and then you just have to confirm that still it will take place despite all, and people are happy to show up," he said. One reason for the huge crowds in Rome could be anti-government sentiment and rejection of the conservative values and policies of Prime Minister Silvio Berlusconi. "This wasn't specifically anti-Berlusconi, but against the 'culture' he and his government spread and support," Sciolari noted. "The people mocked and laughed at them rather than taking their positions seriously. Although we are seeing repression and security campaigns in Italy that are passing any limit, pot lovers and patients know that, Berlusconi or not, no government will give anything for free." "It's always large in Rome," said Joep Oomen, coordinator of ENCOD, the European Coalition for Just and Effective Drug Policies. "It is like it is a yearly event for the whole nation, although some people say most go for the party than for anything else." Things weren't nearly as active in Oomen's home city of Antwerp, where he reported some 50 people showing up, or even in Amsterdam, where the crowd was estimated at somewhere between 500 and 1,000 people. Part of that could be due to complacency in countries with relatively lax drug laws, Oomen said. "People don't realize they can still lose their freedom until it is too late," he said. "But once they do understand how important it is to get it legalized, they are supposed to become more active in the movement. These marches can act as eye-openers for new generations." In Berlin, organizers doing their first Global Marijuana March pulled in several hundred demonstrators, with the crowd swelling to more than a thousand by the time it reached its final destination, a reggae club, where the party continued into the night. Although organizer Mathias Meyer hinted at disappointment with the crowd size, he is going to do it again next year. "The march was quite nice," he reported. "The police were very calm and liberal. One cop jokingly asked us where we hid the stash, but then smiled and walked on. We think it was quite good for our first strike." Vienna saw about 2,000 people show up, as did Prague, while some 5,000 marched in Madrid. Other European marches typically pulled in dozens or hundreds -- except for Greece. 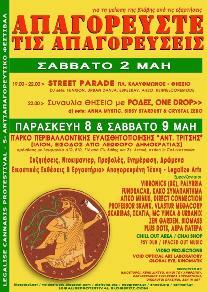 Athens, radicalized by weeks of street fighting a few months back, was the scene of one of the larger European marches, with more than 15,000 people showing up for the "protestival" organized by Iliosporoi, the InfoAction Youth Network on Political and Social Ecology. "It was more than good -- it was a perfect moment of our life," reported an unnamed Iliosporio activist. "Thousands of people came Saturday to demonstrate with their smiles and their happiness that the laws and the state politics about drugs have to change," he said. "The so-called war on drugs -- designed from the USA and imposed on almost all governments of the world -- has had much worse effects on our societies than that other classic failure of the USA, the amazing idea to make alcohol illegal," he said. "We legalized marijuana in Athens this weekend," he continued. 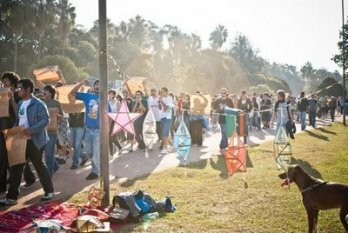 "This festival celebrated personal and social autonomy and the liberation of public space. All of us legalized marijuana without expecting the laws to change." Brazil was also the scene of Global Marijuana Marches, with six cities participating in the Brazilian marches. On March 3, nearly 500 people marched in Florianópolis and 1,500 in Recife. Last weekend saw 2,000 people, including the Brazilian environment minister, marching in Rio de Janeiro, 250 in Belo Horizonte, and 500 in Porto Alegre. Brazilian marchers in some cities faced threats from authorities to prosecute them for "apology for crime," as they had done in past years. Rafael, a Porto Alegre activist with Active Principle, reported that marchers there won an injunction from a local judge protecting their right to express their viewpoints. But that wasn't the case in eight other Brazilian cities, where marches were cancelled as appeals of bans work their way through the courts. "For many years, ministries have banned local marches, accusing people of being involved in the drug traffic or 'being anonymous,'" Rafael explained. "Last year, of 15 cities, only four marched because of the bans, but none of those cases were actually tried because the marches had already passed, which suggests the ministries were only trying to ban the marches. This year, we will bring those cases, because we know they're going to lose. Our constitutional right to discuss drug policies outweighs any 'apology for crime,'" he said. In Rio, Environment Minister Carlos Minc spoke to the crowd, advocating in favor of the legalization movement. Although he said he came as a private citizen, he added that he had always attended the marches and wouldn't stop just because he was a minister. 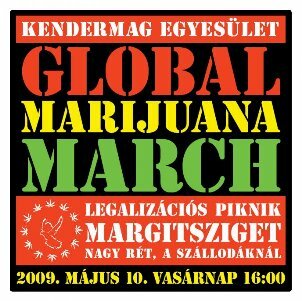 Another May, another round of Global Marijuana Marches. With even the US seeing the first signs of support for legalization reaching the 50% mark, maybe soon marchers will have something big to celebrate.